Echo is returning as relief Galley Coordinator after joining the Adventuress crew last year as a month-long intern. Most recently hailing from Portland, OR, he loves facilitating a connection to the environment that emphasizes how important it is to respect and steward our ecology as a vital part of our community. His work with youth is also tied to his dedication to social justice, having been trained in facilitation by the Oregon Center for Educational Equity. Before stepping aboard this year, he was an outdoor environmental education instructor at Camp Orkila on Orcas Island. In his free time he loves to bike, swim, and study medicinal plants. Tommy Chisholm currently resides in Olympia, WA, where he studies Creative Writing and Aesthetics at The Evergreen State College and works as a peer tutor at the college's Writing Center. He has done some winter maintenance aboard Adventuress and is happy to be joining the 2015 sailing season as a month-long crew member. Emily joins the crew of Adventuress after graduating from Western Washington University in June with a degree in Marine Biology. When not in school, she has spent time sailing on tall ships along the West Coast. She has also worked at the Marine Life Center in Bellingham and is excited to share her passion and knowledge of marine life in the Salish Sea while on Adventuress this summer. Kathryn Hoerauf will always call the Pacific Northwest Coast home, but for the past few years she has been soaking up the sun in New Mexico. She recently earned her B.A. in Outdoor Recreation from Western Washington University, with an emphasis on the Natural History of The Pacific Northwest. She is currently working for a nonprofit wilderness program called Cottonwood Gulch Foundation. She serves as their farmer, growing a beautiful half-acre garden at 7500 feet and planning daily activities for trekkers. She recently received the happiest package she has ever gotten: 26 chirping chicks that she welcomed to their flock at Basecamp. They're growing bigger every day. Frankie grew up in Seattle and is currently living in Olympia. She is a sophomore at Evergreen State College. In April, she had the opportunity to go on a five day sail aboard Adventuress as part of Evergreen's Between Land and Sea program. She had been on Adventuress once before almost eight years back and was inspired to become a cook. Most recently, Frankie has been working as an assistant supervisor with the Washington Conservation Corps. Katie grew up in Mill Valley, CA, and worked her first job as a summer deckhand aboard the Angel Island-Tiburon Ferry on San Francisco Bay. She later joined her college sailing team and ever since then has enjoyed learning how the wind can take her all over the world. Katie earned her degree from Stanford University in Human Biology with a concentration in marine policy and science communications. She now spends her winters in Colorado and her summers living and working on the water. She loves storytelling through writing and film and hopes to increase ocean literacy by connecting even the most landlocked, mountainous populations with the beauty and importance of the ocean environment. Brian has lived in Seattle for four years, but Oregon will always be his home. He has no formal education, but interning on the schooner Zodiac changed his life. He spent the winter learning all kinds of new skills and working with a construction company in Seattle. A fun fact about Brian is that he was once a street performer in Spain. Karen Kunkel grew up on a remote apple orchard in the lower Okanogan Valley, where within her was planted a respect and responsibility for the environment, a love of story-telling in all its forms, and a hunger for what's around the river bend and behind the horizon. She has a B.A. in Theater from Western Washington University and has spent most of her life as a performance artist. Karen last worked as a winter maintenance apprentice for Clearwater. She is honored to participate in empowering and educating all those who come aboard Adventuress, transforming the way we look at ourselves and our environment. Drew comes to Adventuress as a relative newcomer to the waters of the Salish Sea, having learned a love for traditionally rigged boats in the Great Lakes and on the East Coast. After spending last year as Engineer aboard the Pride of Baltimore II, Drew moved to Port Townsend and has been working with local youth on the longboats out of the Northwest Maritime Center. In his free time he likes strategy board games and reading science fiction. Kathy Millar has been an experiential educator for fourteen years, bringing community and action-based, authentic experiences to students in three different states. She calls Asheville, NC, home right now, but is an avid traveler across the country and globe looking for unique experiences to learn, teach, and serve. As a young woman, she fell in love with sailing. Adventuress will be her return to this passion and she looks forward to sharing the incredible ship and sea with everyone she meets. Alison Mitchell calls Marion, MA, her hometown. She is currently studying Marine Biology and Small Vessel Operations at the Maine Maritime Academy. Her last job was as a marine technician intern on the R/V Huge R. Sharp at the University of Delaware. Chelsea joins the crew from Boynton Beach, FL. She graduated from Florida Atlantic University with a degree in Geography and certificates in Environmental Science and Geographic Information Systems—all while working at her local surf shop. She also interned with Loggerhead Marinelife Center and worked with the Museum of Discovery and Science teaching about all things science. 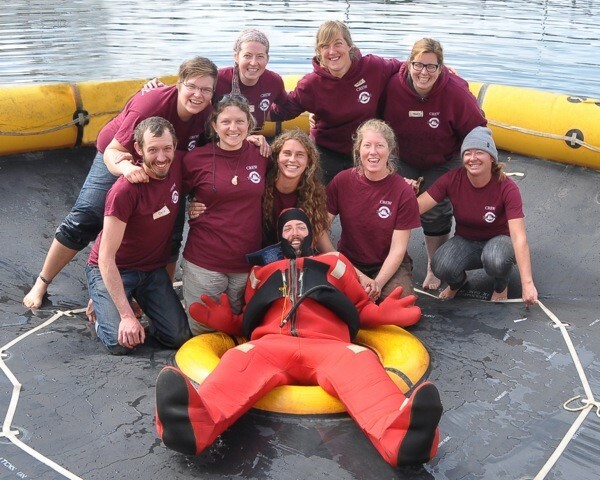 Joining the Adventuress crew for the first time, Jennifer spent Fall 2014 with the Sea Education Association learning about nautical science, oceanography, and maritime history on board the SSV Corwith Cramer. She is a rising senior at Kenyon College in Ohio, where she will earn her B.A. in Anthropology and Environmental Studies. In her spare time at school, she teaches and competes in ballroom dance. Daniel Solof calls the Pacific Northwest home. He holds a B.A of Interdisciplinary Studies in Social Stewardship at Western Washington University. Most recently, he was working with Pacific Quest as their Lead Program Guide in their Rites of Passage program in Hawaii. His favorite berry is the thimbleberry. Samuel grew up next to the sweetwater sea they call Lake Michigan with stories of his Kiwi grandfather racing wooden sailboats he built with his brothers. Nowadays, Samuel lives in Oakland, CA, and teaches heavy weather sailing at OCSC on the San Francisco Bay. But wherever he is, he can usually be found with the cormorants, getting his vitamin D and singing out to the spirits of righteous mutineers and rebel slaves who shaped the only course worth sailing. Jo Wallace grew up in the Seattle area. Her first time sailing on Adventuress was eleven years ago. She has been on several programs since then and in more recent years has come aboard as a crew member. She returns again to us this year as a season-long crew member after receiving her B.A. in History from Bates College in Maine. Her most recent job was as a medical scribe in Tacoma, an experience that led her to pursue Medical School. Esther Whitmore grew up in eastern Washington in a family of eight children. She has been working seasonally for Sound Experience for three years, most recently as Mate on Adventuress for the 2014-2015 winter season. Esther's most recent adventure was sailing the inside passage from Haines, AK, to Port Townsend with friends. Chris Fanshier is from the Willamette Valley of Oregon. He has spent the last decade working as a geologist, traveling the world, and recently serving as an educator / deckhand. This is his second season aboard Adventuress. Megan Frey grew up sailing on a small lake near Lake Michigan. Ever since her grandfather explained that she could sail to anywhere in the world from that very lake, she has spent her time proving him right. Megan keeps a small shack near the sea as her home base when she is not having adventures in various parts of the world. Bill Kelly is returning to the Adventuress crew after a few years of learning on other boats. He is a graduate of the Evergreen State College and a several time champion of Hungry Hungry Hippos. Kirin Lattomus started sailing traditionally rigged vessels on the East Coast, dabbling a little in the Caribbean and the Great Lakes. While she loves cooking for crew and passengers, she also plays on deck and in the rigging whenever possible. She is very excited to experience what the West Coast has to offer. Keene Morrow hails from northeast Connecticut, where their cat still lives. They came to Adventuress this year while in search of more knowledge and a fantastic community; it proved successful. Marisa Nixon has lived in western Washington for the last few years, but originally hails from Rhode Island. After some time working with trails and plants, she decided she missed the sea. She has been involved with different sailing and science education programs ever since. After graduating from Occidental College in 2013, Caitlin O’Morchoe planned to apply to grad school after a season aboard Adventuress. Two years later, she is still thinking about grad school and still aboard Adventuress. Caitlin is drawn back season after season because of the environmental and experiential education, the sailing, and the wonderful Sound Experience community. Alea thought she was only leaving her home on Whidbey island to join Adventuress for one month back in 2013. Three years later she continues to be captivated by the community that surrounds Adventuress, the people she gets to share life-changing moments with, and the spectacular sailing. She owes many of her closest friends to her time aboard and could not imagine life without Adventuress. Zach Simonson-Bond has worked with Sound Experience and Adventuress since 2007. Starting as a Deckhand, Zach has served many positions over the years, including a two year stint in the Office as the Development and Communications Coordinator. After taking some time away to sail on various East Coast schooners and attend the Northwest School of Wooden Boatbuilding, Zach is back on Adventuress as Chief Mate. He looks forward to many future seasons with the organization. Mary Welch grew up in Seattle, but spent the last 5 years on the East Coast. She moved back to the beautiful Northwest in order to spend more time in the mountains and on the Salish Sea. Her many dreams include adventuring in new places and becoming a super fun field trip teacher, both of which she has achieved aboard Adventuress. Stepping aboard for the the second time as a Shipboard Educator, Gaia grew up on San Juan Island watching Adventuress sail in her backyard. She graduated from Fairhaven College with a degree in Human Ecology and Sustainable Food Systems and has also worked with the Soundwatch Boater Education Program and the Whale Museum in the San Juan Islands. Her experiences and enthusiasm make her a perfect match for the Sound Experience community!